Digitcare is one of the world's leading suppliers of quality examination and specialty gloves. Digitcare offers a full line of latex, synthetic, sterile and non-sterile hand covering products that provide the highest level of protection. Digitcare products have been University and field tested with proven durability and class leading performance. Digitcare gloves are manufactured to strict standards that meet or exceed international and US performance codes. 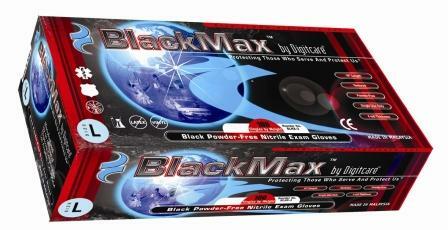 BlackMax is a 5 mil, 10" length, fully textured glove great for EMS, Tactical, Swat and Police. Digitcare's proprietary formulation makes the glove extraordinarily pliable with high stretch characteristics. It is black in color for reduced contrast with fluids/uniforms/inks and dyes. The glove is also puncture resistant.